We are Manufacturers and Exporters of Cu-Ni 70/30 Pipes, Cupro Nickel Alloy 70/30 Seamless & Welded Pipes & Tubes, Copper Nickel 70/30 Pipes and Tubes Supplier in India. Neon Alloys is one of the prime manufacturers & exporters of Copper Nickel (Cu-Ni 70 / 30) Pipes and Tubes that are being sourced by using high quality of raw material and makes sure to provide durability of highest quality of industry standard products. Curpo Nickel UNS C71500 70/30 Pipes are recognized for their consistent performance in marine applications. Due to its hardness and to the type of oxide whereby its surface is self-protected, 70/30 Cupro Nickel has excellent resistance to impingement and erosion-corrosion by of suspended solids in sea water flowing at up to 3-3.5 m/s (10-11.5 ft /s). Like all Cupro-nickels, 70/30 Cupro Nickel is virtually immune from stress-corrosion cracking. It can be very sensitive to deposit attack and is therefore not recommended for stagnant or slow moving (under 1 – 1.2 m/s or 3.5-4 ft/s) water. These Copper Nickel Alloy, 70/30 Cupro Nickel is very widely employed in water desalination plants, especially in the most critical areas such as the heat reject and brine heater stages, as well as in the under cooling areas of power station condensers, in the chemical, petrochemical and food processing industries and, more generally, in all applications where top corrosion resistance is required from both the shell and tube side. 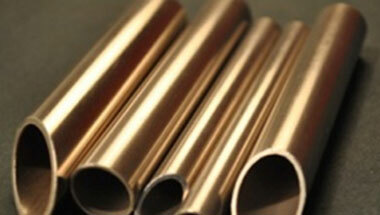 Copper Nickel UNS C71500 ERW Pipes & Tubes Manufacturer. Cu-Ni 70/30 Tubes Supplier, Cupro Nickel Alloy 70/30 EFW Pipes Exporter. Democratic Republic of the Congo, Trinidad and Tobago, New Zealand, Uganda, Germany, UAE, Vietnam, Peru, Dubai, Italy, Iran, Israel, Tunisia, Thailand (Bangkok), Houston, Egypt, Iraq, Russia, Chine, Azerbaijan, Turkey, Kuwait, Venezuela, Brazil, Sri Lanka, Saudi Arabia, Ethiopa, London, Colombia, Morocco, South Africa, Sudan, Indonesia, Kazakhstan, Mexico, Australia, Bahrain, Argentina, Mozambique, Cameroon, Nigeria, Angola, Africa, UK, Canada, Malaysia, United States, Algeria, Ghana, Jordan. Luanda, Fez, Ouagadougou, Tripoli, Manama, Data from the UN, Durban, Riyadh, Lusaka, Maputo, Kinshasa, Rabat, Kolwezi, Lubumbashi, Zaria, Khartoum, Algiers, Maiduguri, Jeddah, Singapore, Dakar, Tehran, Istanbul, Nairobi, Conakry, Bamako, Alexandria, Kano, Soweto, New York, Mecca, Doha, Omdurman, Freetown, Brazzaville, Kampala, Cairo, Kaduna, Yaoundé, Giza, Pretoria, Ibadan, Subra al-Haymah, Port Elizabeth, Tel Aviv, Beirut, Hong Kong, Dammam, Mbuji-Mayi, Bethlehem, Dar es Salaam, Muscat, Cairo, Abidjan, Johannesburg, Bulawayo, Casablanca, Dubai, Addis Ababa, Jerusalem, Port Harcourt, Accra, Cape Town, Abu Dhabi, Lagos, Harare, Sharm el-Sheikh, Mogadishu, Colombo, Antananarivo, Douala, Byblos, Benin, Aqaba, Amman.